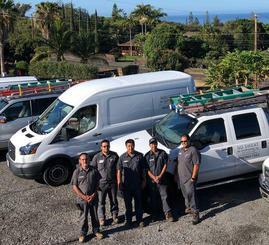 "We own a luxury condo in Waikoloa and have had the pleasure of working with Alex and Lucia at No Sweat for several years now -- first in optimizing a 22-year-old unit, and then in installing a new, high efficiency heat pump with a hot water heater tie-in. In taking me through my equipment and accessory choices, Alex was patient and knowledgeable and could point me toward sources for further research. His work is caring and precise, he is personable and trustworthy, and he is highly motivated to provide great service. No Sweat really values the relationship they share with their customers. While No Sweat's client base has grown to encompass large business contracts, we have never felt that our single unit was shunted aside in favor of the big fish: we have received attentive and informed service in all our dealings with No Sweat. We couldn't be happier, or more grateful, for having met Alex and Lucia, and we look forward to our scheduled service visits with them." “We needed to come up with some energy-efficient AC split-system options and cost estimates for our single-family residence in Kailua-Kona. Alex at No Sweat AC did an onsite walk through with me, provided AC equipment system options in various price ranges and features, and then gave us timely feedback to our questions. Once we decided on the system we wanted, Alex and his team were friendly and efficient during the installation. 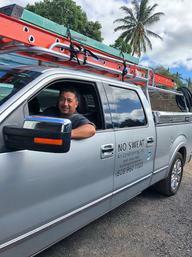 It can be a challenge to find competent tradespersons here on the Big Island, and I highly recommend Alex and his No Sweat AC team for anyone considering an AC system installation." Ron Morton dropped by to thank Bill for referring you for the repair of his furnace. Ron had nothing but good things to say about you – said you were competent, reliable and polite. He was very pleased with the service you provided. It’s really nice to have that kind of feedback when you refer someone. Thank you for doing what you do so well. Note: Provided quick and expert assistance when I had a problem with my LG split A/C. 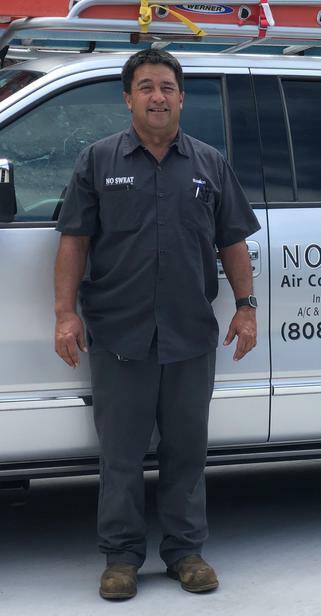 No Sweat Refrigeration has been our choice for two years and will continue to be our choice to not only service, but to install our refrigeration equipment. The company is dependable and very professional. The owners, Alex and Lucia, are extremely polite, professional, and diligent in the way they operate their company. They are currently installing three large walk-in refrigerators for us, and we are extremely satisfied with the good work they do. I would highly recommend them to anyone who wants to be treated fairly and have good professional work done. No Sweat Air Conditioning is a company that you can rely and depend on. I am happy working with Alex. All of the services he provides are awesome! He is professional and has excellent workmanship. Scottie is the man! On vacation and had a horrific night after the A.C. in our unit died. Our 10 month old daughter's room was over 90! She had a very bad night sleeping, as did my wife and I. Scottie with No Sweat showed up 15 minutes after the property manager called which was unexpected. He was really nice with our family and took pride in his work. He explained what went wrong and how he wouldn't take any shortcuts to fix the problem. He recommended some good eats on the island which we ate that day! He was very friendly. If you are able to, ask for Scottie. He's great at what he does and is super cool and nice. Thanks Scottie! You really saved the day for us!! Thank you so much for a wonderful job! You and your crew are the best! I am really pleased with the units and with the professional way you folks went about the business of this installation. In the middle of the summer my Jandy pool pump required repairs. I am located in the Kona Vistas subdivision of Kona and contacted ALL the air conditioning companies in Kona, Waimea and even as far as Hilo. They all had excuses and didn’t have the time to come out to even look at the problem. Finally, I spoke to Alex at No Sweat. They were also busy servicing air conditioners, but were the only company to come out. Their technician, Mel, contacted Jandy-Zodiak on the mainland, made a proper diagnosis, obtained the parts, and successfully completed the repair! If you have an air conditioning or pump problem, No Sweat A/C are the people to call! I just wanted to thank you for responding so quickly last week with my request to have a repairman come out to find out why my central ac system wasn't sending out cool air. Your guys arrived the same day, were efficient, neat, and informative. The system is now working just fine. Thanks again and I plan to recommend you to my friends. We really enjoyed working with you on this one. I have to say we love the work you did and how much more livable the mini split air conditioning makes the house. And it is so quiet! I hope you guys are doing well and keeping busy. I wanted to tell you guys that your crew did a fantastic job on my three properties. I was very impressed by their timeliness, team work, attitude and going the extra route of prepping and cleaning up inside my properties. I've worked with many subs over the years that have the attitude that "you're not paying me to be the cleaner." The little bit of clean up goes a long ways in my opinion. No Sweat AC is very professional and I would be more than happy to recommend you guys anytime. LMK if you ever need a referral from a local property owner and general contractor. Have a nice weekend!